A new production model which has already met customer’s satisfaction for its excellent performance and competitive price. Nowadays MiniLab instruments are ones of the smallest and lightest compact optical emission spectrometers available on the market with outstanding analytical results in this category. S1 MiniLab 150 is a Multi Matrix spectrometer for Ferrous alloys, Aluminium alloys and Cupper alloys. Thanks to its innovative optical design, S1 MiniLab 150 is the unique spectrometer of its class to mount up to 4 high resolution CCD with 3.648 elements to ensure the best spectral resolution (<15pm). S1 is equipped with software “Single Sample Standardization” which allows to standardize the unit with just one single sample for several bases. S1 MiniLab 150 combines easiness of use, low maintenance cost, very competitive price with the most advanced technological optical and electronical components. The innovative argon purged optic, with an argon consumption of 10 l/day only, ensures the maximum light transparency even in UV region at a negligibile cost. 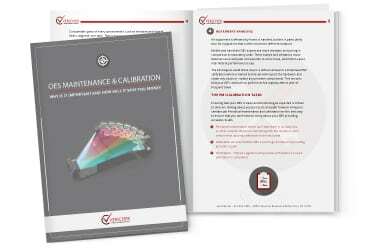 What Does Calibrating a Spectrometer Do? Registered with ANAB, ISO/IEC 17025:2005 quality system. Periodic maintenance (PM) and calibration are essential tasks that you need to do on a regular basis to ensure that your equipment continues to function as intended.